I bumped into the Mayor and his Chief of Staff, Kevin King, at the Pride flag raising and later at the Pride Parade. While I didn't particularly want talk about the PD they seemed to and when I did not pursue the question the comment was made "well we said sometime in July, and followed with, "but we didn't say which July" and a hearty chuckle. OK it was a parade and everyone was in a good mood, but somehow I felt the whole new Police Chief thing was a bit more serious than that. The problem is the longer this drags on the more people way in with their choice, and the more people are now on the record that the Mayor may upset with his final decision should he ever reach one. The latest local voice to speak up is John Wilson of FOX 13 news My View St. Police Chief Police Candidates. John Wilson makes all of the salient points in his editorial and raises the question what is the Mayor waiting for? There are really only two candidates that really stand out current assistant Chief Melanie Bevan, and Goodyear Arizona Police Chief Jerry Geier. 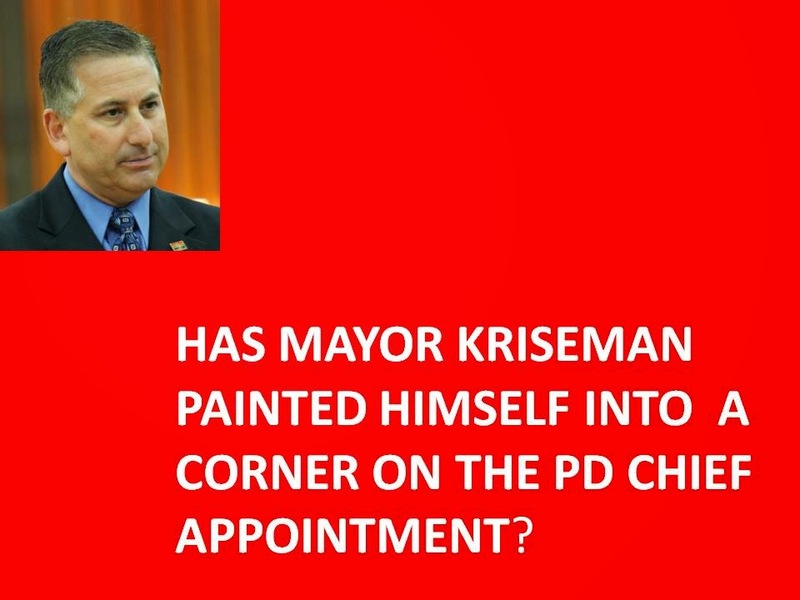 My choice Is Assistant Chief Bevan as I indicted in my Post: Assistant Chief Melanie Bevan is the Best Choice for St. Pete's New Police Chief for all of the exact reasons John Wilson articulates. As an outsider Geier will face an almost insurmountable internal power struggle fueled by the old now outside interests that want to continue to run the St. Pete PD. Kriseman should not lose sight of the fact that these are the very people who got the PD into the mess it is in and the ones who have let south St. Pete suffer under a continuing crime problem. I am not at all sure what value the Mayor and his senior staff put on this cat and mouse game with the Chief of Police position. Their approach is not cute, clever, smart or appropriate. It's just simply bad municipal management to play games and put a vacation ahead of a critical appointment for a position as important as the Chief of Police. Let's all hope the mayor comes back refreshed and enlightened or we may have to wait until next July for new Police Chief.